Enter and explore a whole new world in the caves underneath Nottingham and descend into the dark depths of the original Anglo-Saxon tunnels, meeting real cave-dwellers from its dramatic hidden past. See how these caves have been used and adapted over the Centuries by local people to escape and take refuge from the world above. These unique hand-carved sandstone caves dating from the 13th century were almost lost for ever when the 'Broadmarsh Shopping Centre' was built in the 1960s. Nottingham was an important leather producer during the 15th and 16th centuries and our Pillar Cave features the remains of Britain's only medieval underground tannery, where the "delightful" aromas of the smell box can be experienced. Walk beneath the remains of Drury Hill, one of the oldest streets in Nottingham, until its demolition in 1968. Experience the appalling conditions of a Victorian Slum, the remains of which can be seen in the caves. Formerly a pub cellar, the constant cool temperature of the Caves provided the perfect conditions for the brewing and storage of Nottingham's celebrated ales. 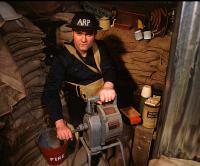 The Caves most recent use was as air-raid shelters during World War II and includes an array of wartime memorabilia. Over 500 high explosive bombs were dropped on Nottingham during May 1941 and over 200 people were killed. Most Nottingham people stayed safe underground, partly thanks to its network of caves. Nottingham folk dug down through the sandstone to create a natural water source for their families. Although the water was initially fresh, little thought was given to neighbouring cesspits and the porous nature of the rock! For schools, in addition to our existing audio tour, we can offer guided visits. Please request our schools information pack. Group visits to the Caves are available in the evening. These can be tailored to your specific needs and we offer special rates for groups of more than 30 people. Although every effort will be made to assist persons with limited mobility, we regret that owing to the nature of this attraction, there is no access for wheelchairs or pushchairs. Assistance is available for the hearing impaired. Our Audio Guide is available in: English, French, German and Spanish. Our textual guide is available in: Italian, Japanese and English. Located on the 1st floor of the Broadmarsh Shopping Centre. Parking available in the shopping centre multi-storey car park (get 50p off 3 hours parking by presenting your parking ticket at The Caves reception).